At the beginning of the 1930s, amateur woodworking emerges as a significant nationwide activity. 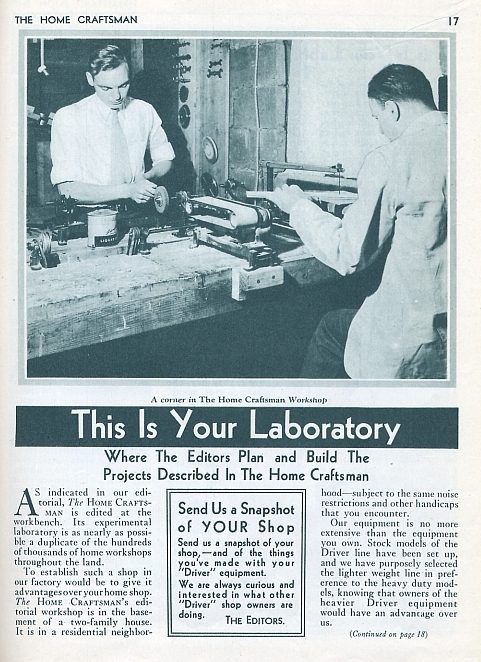 According to article number one of issue number one of Popular Homecraft, at the beginning of the 1930s, a surveyed showed that there are a reputed 77,000 home workshops in America. (Getting documentation on this statistic is proving elusive, but I will keep on the lookout. According to Chris Gleason, in the early '30s, there were "over 77.000 Delta machine owners". Taken together, these two bits of evidence reveal the emergence of amateur woodworking as a major leisure pastime. And, with the Depression causing mass unemployment, the question of leisure, itself, emerges as a national issue, and new term -- skill hunger -- is coined. For more, checkout the beginning of this document and this account of The Evolving Concept of Leisure . Recently I started subscribing to the online database of newspapers -- www.newspaperarchive.com . It's truly huge, going back to the 1790s, listing currently about 2.5 million pages! 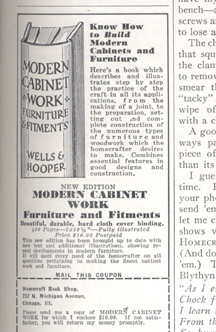 I soon discovered that www.newspaperarchive.com covers woodworking, but covers it in a way that must be qualified. First, woodworking as an activity, itself, such as the activities of "guilds", "clubs" and the like, is covered, but not entirely satisfactorily, because many of these activities by local groups go unreported. Or, worse, the keywords -- that is, the terms used to search for articles -- are nebulous. The words reporters use to describe the group activities of amateur woodworkers in one part of America are not, evidently, the same words reporters use to describe similar activites by woodworkers in other parts of America. 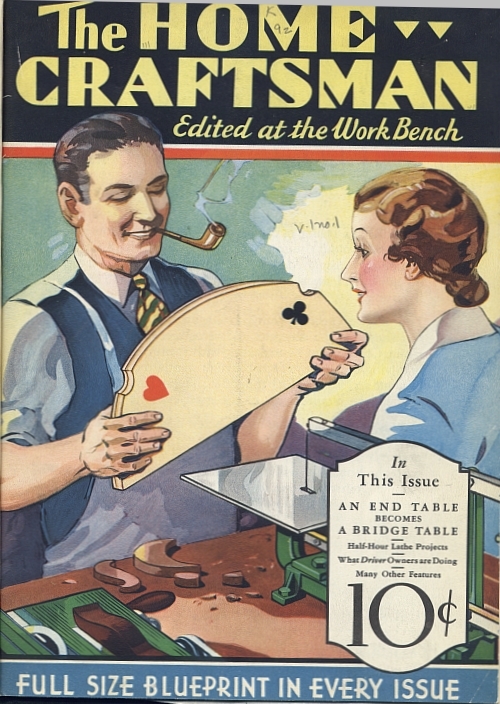 Popular Homecraft began in publication in 1930, with six issues per year. Chicago-based, independent, rather than sponsored by a power tool manufacturer, PH's success allowed it to boast a circulation of 83,500 copies by May-June, 1931! Its pages covered much more than woodworking, but woodworking was its primary focus. The issues are almost 100 pages, truly dwarfing the ca. 20-page size of The Deltagram and The Home Craftsman. Checkout PH's first article! From the beginning -- unlike the in-house periodicals, Home Craftsman and Deltagram -- most articles were signed. "By popular demand" from its readers, as the cliché goes, PH's editors soon moved to publishing 12 issues per year. 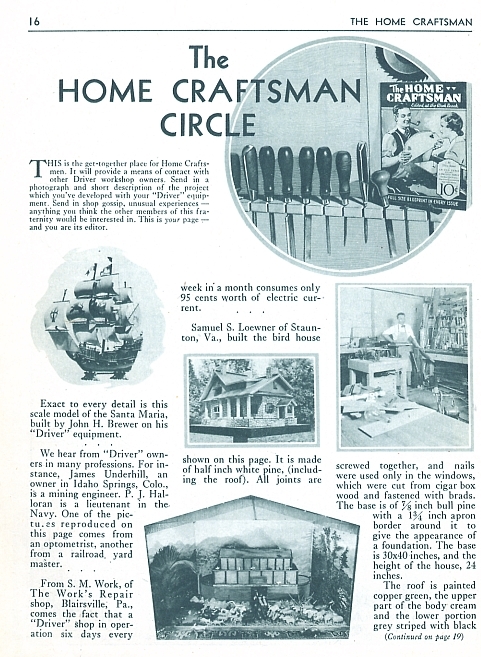 As is suggested by "homecraft" in its title, PH's coverage was broader that just woodworking; it also included metal crafts, model-building, and home maintenance. second, that, more and more, "amateur" woodworkers were supplementing their incomes by selling products produced in their home workshops. Already -- from PH -- I have uploaded a few, significant items, but -- in the future -- anticipate that I will upload many additional items. Activities of local chapter of the National Homeworkshop Guild -- link -- are regular features, and I will report on these more fully later. Another feature combines the two points above -- small-scaled power tools and amateurs selling their projects. Begun in Rockford, IL in 1933, by 1937 the NHG boasted about 500 chapters in the United States and Canada. While Popular Homecraft gave much attention to it in the pages of that periodical, the existence of the NHG was never really acknowledged on Home Craftsman's pages, a fact that really puzzles me. In 1931, manufacturers of scaled down electrically-driven power tools designed for the amateur woodworker's home-shops launched two periodicals. First, Walker-Turner's Home Craftsman, was much more successful than the second, Delta Machinery's The Deltagram. Source: Elmer Calkins, Nation's Business article, "Depression is the Fashion", July 1932, 20, page 7. Why The Deltagram? WE ARE not going to start out by telling you that now, at last, the craftsman is to have a magazine of his own. You would know, just as well as we, that this would be just so many words. The Deltagram" cannot pretend in the least to take the place of any of the splendid magazines which have been catering to the wants of the home mechanic and the craftsman. Nor has it any such pretension. The purpose of this little journal is simply to be of help to Delta craftsmen; owners of Delta machines. We, at the factory, receive many suggestions from our craftsmen friends, some of whom tell us about their ways of doing things, about the furniture, toys and hundreds of other things they make, about their ideas on workshop layouts, original ways of using Delta equipment and hundreds of other things. Many of these suggestions and ideas would be of vast benefit to other Delta owners, but heretofore we have had no practicable means of passing them on, except when an owner wrote to us for a solution of some problem that had put him up a tree. We have had the idea of "The Deltagram" in mind for a long time, and now, at last, we are able to realize it. We want to make "The Deltagram" just as useful and as serviceable as any of the rest of your Delta tools, for that is just what it is: another tool to enable you to get the very utmost in pleasure out of your hobby, if woodworking is your avocation, or in service out of your machine if it is your vocation. And whether this tool is to be a keen or a dull one depends to a great extent upon yourselves, for the editor needs your assistance in making and keeping it "sharp." Source: The Deltagram, Volume 1, No. 1, January, 1932, page 3. Delta's "house organ" The Deltagram consisted of about 20-pages monthly of articles for the hobbyist woodworker. Advertisements for Delta products were scattered also throughout each issue. The many images of Delta tools show woodworkers constructing projects, for the most part, scaled to the tools of the era. The Deltagram was published 6" x 9" format until the end of 1949. (The issues from 1932 to 1949 were bundled into a 4-volume set, and I was able to find an affordable set on Bookfinder.com) In January 1950 the format was changed to 8 1/2" X 11". Home Craftsman, edited by Harry Hobbs, lasted from 1931 to 1965, and at one time -- in the 1950s -- boasted a subscription list of over 200,000 subscribers. 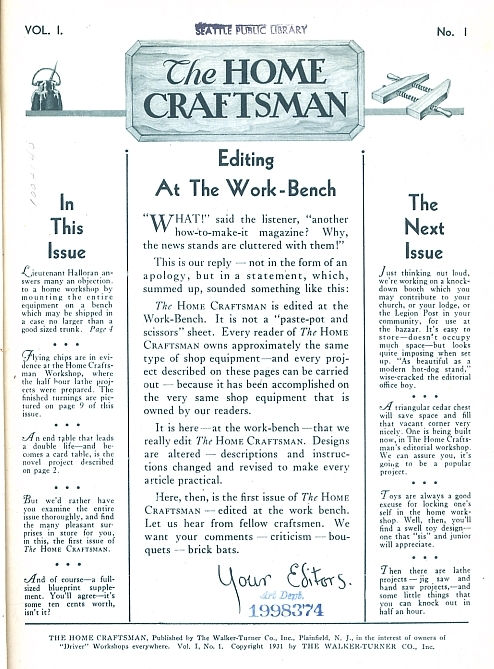 Home Craftsman started with six issues per year, without advertising, but slowly evolved into a monthly magazine, directed at the home owner -- with home improvement articles -- and the amateur woodworker. Most articles in Home Craftsman were signed by the authors, but some were anonymous suggestingsome in-house editors were responsible. Lester Margon, the celebrated illustrator of furniture pieces from museums in America, Canada, and Europe, had a monthly article, which -- judging from the letters -- was a "hit" with the readers, who delightedly sent in photos of their results of building Margon's plans for break fronts, highboys, lowboys, and the like. Occasionally, in issues of HC, Franklin Gottshall and Herman Hjorth, both noted instructors on woodworking in Industrial Arts institutions, had articles -- also on a museum furniture pieces -- but only about once a year. As I was paging through Home Craftsman volumes for the '30s and '40s, I looked for -- but did not find -- mention in articles and/or letters of activities of the National Homeworkshop Guild, the amateur woodworking organization I note above. The reasons for this policy by HC of ignoring a woodworking movement that I suspect comprised most of the its subscribers is very puzzling. The images on both left and right, below, illustrate how books were promoted to readers of Popular Homecraft. 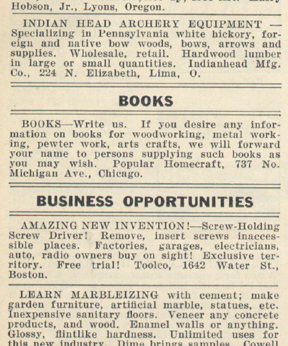 In effect, Popular Homecraft (and Home Craftsman) took on the role of book distributor. Both Popular Mechanics and Popular Science [create links later], very successfully launched in the 19th century, contained articles on woodworking, either about tools and/or projects for woodworkers. I have examined several master's theses where the authors conducted surveys of the NHG. Most are disappointing, primarily because the data reported is very sketchy. One thesis, by Marvin A Powell, "Survey of the National Homeworkshop Guild", Colorado State University, 1935, includes the table on the left. While the number of NHG members surveyed is very small -- a little over 600 -- the data Powell tabulated shows us information that might be predictable. That is, the top magazine is Popular Science Monthly -- where the founder of the NHG, Arthur Wakeling, was Homeworkshop Editor --. then follow Home Craftsman, The Deltagram, and Popular Homecraft.